When you’re insulating your home or business, you want the best possible option available, both in the insulation type and the professionals that install it. Pro-Seal USA is the first choice for insulation needs in Naples, FL, and spray foam insulation is the first choice for us. Durable, versatile, and cost-effective, spray foam insulation is the latest innovation in the insulation industry, and it’s what we specialize in. XPS rigid board is one of the leading competitors for Icynene spray foam in construction and insulation projects, but when you examine the benefits of each, Icynene spray foam is far better than XPS rigid board in many ways. With the existence of Icynene spray foam insulation, you can leave XPS rigid board’s unworkable rigidity and costly qualities behind. Icynene ProSeal™ and ProSealEco™ closed-cell spray foams are medium-density, continuous insulation solutions that outperform XPS rigid board on every level. From cost to performance to design capabilities, Icynene spray foam insulations are the clearly superior choice. Deciding to use a spray foam will provide several benefits that rigid boards simply can’t, such as compatibility with curved, uniquely shaped surfaces. This is something that XPS rigid boards simply can’t do well, and using Icynene spray foam will allow you to lead your project with design in mind. 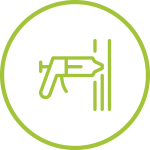 Cost reductions due to less labor and fewer materials being required are also a benefit, as spray foams don’t require an added barrier like rigid board insulation does. Spray foams also mean less construction waste, and you can be versatile in your uses for it, as it’s able to completely cover all areas that would otherwise leave energy-draining thermal bridges. Using Icynene spray foam insulation means your end product will be a high-performance wall assembly solution that can work with and enhance virtually any architectural design approach. It’s cleaner, more cost-effective, easier to work with, and ages better than XPS rigid board, as well as many other insulation types. There’s no contest! Icynene spray foam insulation is an insulation and air barrier material that seals walls, floors, and ceiling cavities against air movement, including spaces around electrical outlets, light fixtures, and the places where walls meet windows and doors. This foam insulation minimizes air infiltration through walls and ceilings, preventing drafts and cold spots in your building while maximizing energy efficiency. The performance of Icynene spray foam insulation means that humid indoor/outdoor air is prevented from entering and condensing in walls and ceilings, which significantly reduces the possibility of moisture getting trapped and building up within. This prevents moisture damage from impacting the building’s envelope and air seal. Icynene spray foam insulation products include half-pound, open-cell and two-pound, closed-cell solutions, which can be used separately or simultaneously on a project to provide long-term thermal comfort, energy optimization, and air sealing. Icynene spray foam insulation products are installed by extensively trained and licensed Icynene contractors only, such as our team at Pro-Seal USA. Using an Icynene spray foam insulation has many benefits, including energy efficiency, longevity, and durability. It’s resistant to moisture, making it unsuitable for mold and fungi to grow, and it provides no nutritional value so it’s not a food source for insects or animals, and they won’t nest in it. On top of this, it is also quickly installed and ready to go, as it is done expanding within seconds of being applied, and after 24 hours of ventilation, is safely cured and odor-free. What’s more is that Icynene spray foam is available in open-cell format, so if you live in a warm climate or one where the seasons can vary drastically in temperature, this insulation’s flexibility will allow it to move with the contracting and expanding of your house with the weather. You’ll never lose your air sealing or temperature and energy optimization. Get a free quote today for your spray foam insulation.